Walt Disney and H. P. Lovecraft have a lot in common: they were both very prolific creators of entertainment, they both crafted rich and weird worlds full of wonder, and they both are rumored to have been really, really racist pricks. If it weren’t for the fact that the former’s creation was a happy cartoon universe of magic aimed at children, and the latter’s was a horrifying universe full of evil and alien powers clawing at the very barriers of reality, it would be a perfect match. As it turns out, there’s at least one person out there who thinks that it is a match made in heaven/hell, and that’s why you can buy a tee shirt with this alternately terrifying and cheerful mascot on the front. 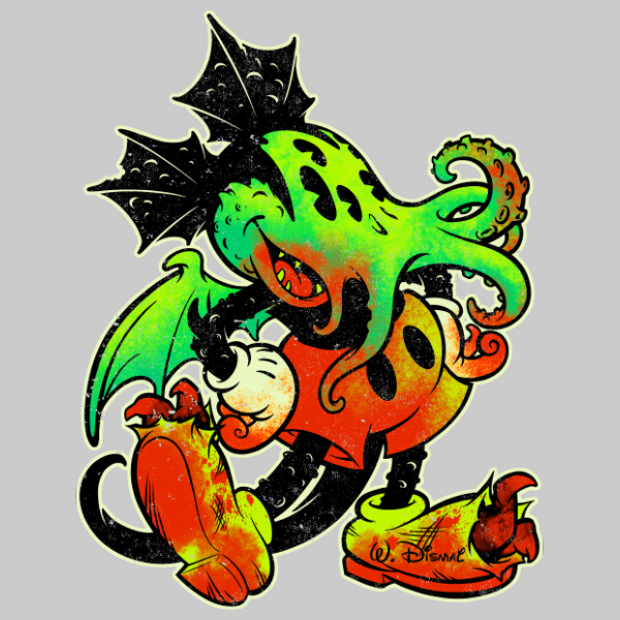 Now we know what horrors lurk beneath the so called “happiest place on Earth.” One day, when Mickthulhu rises from the depths of Splash Mountain, sanity will simple cease to be and all will be enslaved to his will. Either that, or it’s just a shirt that you can buy for $20(USD) at NeatoShop.com.